Creative Writing: An Introduction to Poetry and Fiction is a brief guide that offers plenty of options for the two-genre creative writing course. 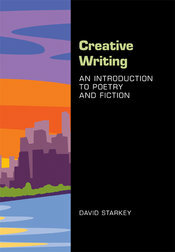 Adapted from David Starkey’s successful Creative Writing: Four Genres in Brief, it starts with lively and highly-praised instruction on the basics of reading and writing poetry and fiction. Then it presents a wide and versatile selection of model contemporary poems and stories for students to admire and emulate. Throughout, it offers a range of checklists to help students shape their poems and stories, as well as inventive assignments to fire students’ imaginations and get them creating on their own. "Starkey’s humorous and welcoming style combined with his ability to articulate the necessary ideas concisely make this book stand out from the others ... His writing is so clear and perceptive and personable that it immediately gives students the sense that they are on a grand journey where they will learn a lot and have a good time doing it."